Rotation is the opposite of Coiling, Counteraction and Separation and it means that one is allowing upper body to follow and turn (i.e. 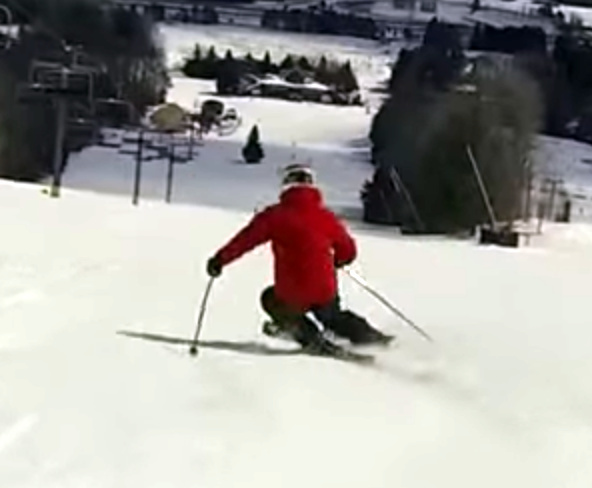 rotate) with the skis or even rotates the upper body more than the skis. It is indicative usually of a "park and ride" kind of skiing and it reduces balance and alignment on the outside ski. It generally is accompanied by a wide stance which is needed to compensate for the reduced outside ski engagement. Also note the inside hand, which is dropped very low and back. Often focusing on preventing that, will help address the overall issue. It can be fixed with an intense focus on coiling. 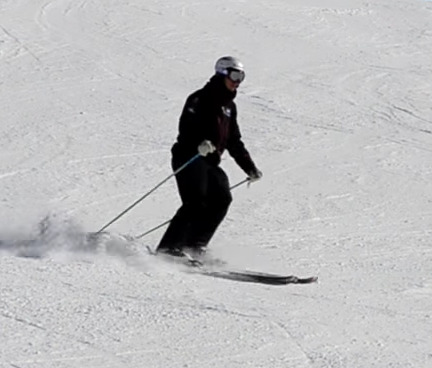 Rotation will generally result in reducing the grip on the outside ski. Rotation is related to Square.